CNOMO direct solenoid valves from YSV series are poppet valves 3 ways, ready to be assembled on the CNOMO standard base. Very small valves available in the normally opened and normally closed version with manual operator. Highly durable and robust, with response time even 20 ms (5 bar). 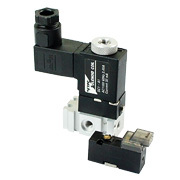 For valves from PICO series solenoid is included in price. Maximum working pressure up to 10 bar. Flow with 5 bar pressure is between 15 l/min and 55 l/min , depending on size of the valve. Working pressure. 5 ~ 60°C. Very small size, from 10 mm to 15 mm in case of Pico valves, and from 20 to 26,7 mm for MINI valves. Built in push type manual operator.